Although in the past I have been intimidated and scared of yeast, I think I am completely over it. After a couple of trials and some winning recipes (whole wheat pizza, wheat bread, peasant bread, whole wheat pitas, mostly whole wheat bread, and dinner rolls) I’m definitely feeling confident. 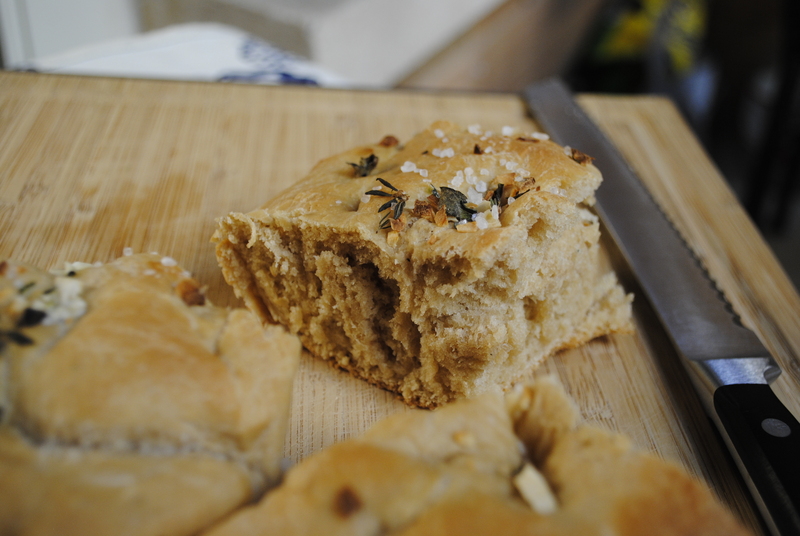 So don’t be afraid and make some bread from scratch today! 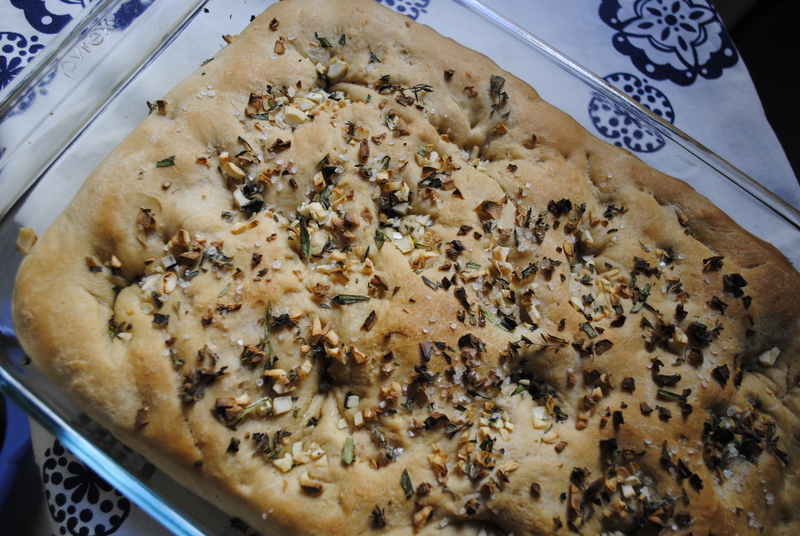 Focaccia is not my go-to bread, but when I saw a recipe posted by A Couple Cooks, it looked so delicious! I had to make it right away. This dough was great, and I can’t wait to make different variations- adding eggplant, onions, or topping it off with some meat. I ended up cutting it up into smaller pieces, this way we could eat some with a salad, or with morning eggs. Otherwise, use this when making a sandwich or when you just need a snack. I hope the heat wave has ended for everyone so you all can turn on your ovens this week to make this. Definitely something great- and I’d love to hear what other variations are out there that everyone enjoys! In a stand mixer bowl mix together the warm water and yeast. Allow it to stand for a couple of at least 10 minutes. Then add in 1 1/2 cups of all-purpose flour, whole wheat flour, salt, olive oil and honey. Using a dough hook, mix the ingredients together. On a low speed, mix the dough for about 10 minutes. Every couple of minutes add in the remaining all-purpose flour (1/2 cup). At the end it should turn into a ball. Place the ball of dough into an oiled bowl. Cover with a towel, and leave it for at least 1 1/2 hours or until it doubles in size. Spray a 9×13′ baking dish with cooking oil. Preheat the oven to 475ºF. Punch down the dough into the bowl, and knead it for another 2-3 minutes. Then spread the dough into the baking dish. Allow it to rise for another 30 minutes. Once the dough is ready, drizzle 1 tbsp of olive oil over the top of the bread. Then sprinkle the garlic, herbs and sea salt on top. With a finger, make small indentations into the dough- about 1/2 inch thick and about 1/2 inch apart. Bake for about 15 minutes, or until the top is lightly browned.